Once bitten, twice as shy? After moving north in early trading on solid earnings from the big banks, Wall Street pared gains with the major indices dipping below opening levels by the end of the day to post modest losses, although closing levels were well above intraday lows. The Dow was the weakest performer among the major US indices, slipping 0.50%, followed by the tech-heavy Nasdaq, down 0.49%. The S&P 500 held up best, dipping just 0.29%. Markets performed well for the week however with the S&P500 and Dow lifting 2%, and the Nasdaq up 3%. The S&P500 encountered resistance at 2,670 last week. 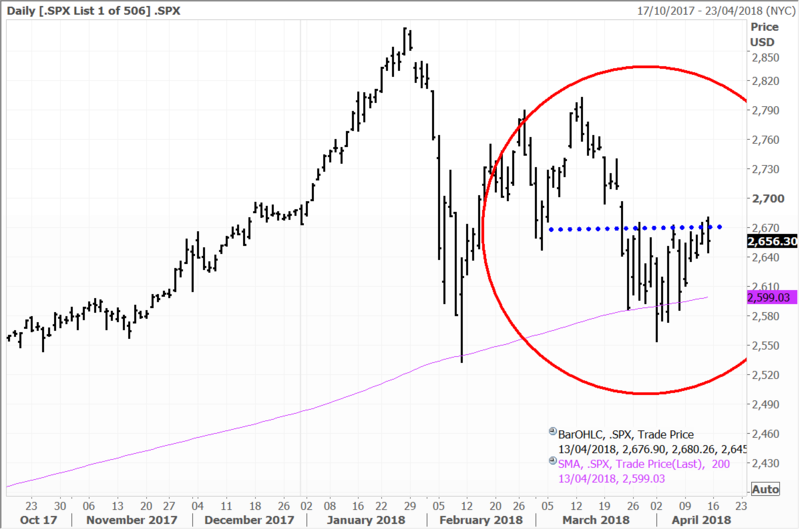 Our scenario is for the index to break through this level on the upside in April and run to 2750/2800 with a strong quarterly reporting season being the probable catalyst. However, it may take some time before new record highs are attained above 2,850. With the Syrian missile strikes “safely out of the way” overall risk factors seem to be dissipating. Putin warned on Sunday that chaos would engulf the world if it happens again. This seemed more like “posturing” with no one actually harmed – which was the objective of the US – in the 101 missiles that were fired. Trade sanctions are about to be ramped up on Russia and Iran. We have not heard anything more out of Washington in terms of the Mueller investigation and concerns that Trump could fire him removes another layer of risk. Markets are not totally in the clear, but with each passing day, it looks as though Trump will leave this issue alone. I think the rally which began last week is set to continue with the quarterly reporting season now underway. Many companies report this week including Netflix later today and this will be a result that will be closely watched by the markets. Barrick Gold and Coeur Mining tracked gold prices higher Friday, closing up 2.1% and 2.7% respectively. Alphabet edged down 0.1%, while Apple eked out a 0.3% gain. Logistics giant FedEx, which we view as a relatively cheap proxy for the growth in e-commerce, gained 1.1%. Volkswagen was little changed (+0.1%) after announcing on Thursday that it was replacing CEO Matthias Mueller with brand boss Herbert Diess. Volkswagen confirmed it was creating a new management structure to support more nimble decision making. This is as the industry faces big changes from the rise of electric cars and autonomous driving. Competitor BMW, which has also outlined a major push into electric cars, was up 0.4%. In Paris trading, shares of the real estate investment trust Klepierre gained 3.6% after it opted to withdraw a bid for UK mall owner Hammerson. The world’s luxury goods retailer, LVMH, topped off a solid week by eking out a 0.6% gain. The company reported a strong sales trading update earlier, with underlying double-digit sales growth across all its major divisions buoyed by a resurgence in Chinese demand. Basic materials play Heidelberg Cement ticked up 0.7% in trading, while consumer goods giant Danone advanced 0.5%. In corporate news and movers, defence Ultra Electronics surged 4.3% on a broker upgrade amid the current geopolitical tensions. Soft drink seller Britvic advanced 1.0% and packaging business DS Smith closed 2.2% higher. Miners gained, with BHP up 0.8%, Fresnillo tacking on 1.4% and Randgold tracking 1.6% higher. Electronic components producers and semiconductor chip equipment gained, with the likes of Advantest, TDK Corp and peers rising between 2% to 4%. The megabanks also had a strong day, with Mizuho, Mitsubishi UFJ and Sumitomo up between 0.9% to 2.5%. Sony ticked up 0.9% and energy firm Inpex advanced 1.4%. Robotics leaders Fanuc and Yaskawa Electric were mixed, with Fanuc up 0.9% and Yaskawa down 1.6%. In Hong Kong, China Mobile finished flat, while both social media giant Tencent Holdings and oil & gas major CNOOC slipped 1.3%. The Macau casino stocks, rallied strongly into the weekend on higher volumes after recent strong data and strengthening sentiment. Sands China advanced 1.3%, MGM China gained 2.2% and Wynn Macau surged 4.1%. In South Korea, Samsung Electronics was up 1.6%. In Australia, the market had a positive session on Friday, with the ASX200 adding 13 points to close at 5,829. For the week the index advanced 0.7%, with the resource sector leading the way on higher commodity pricing, and easing fears over a trade war between the US and China. BHP and Rio Tinto were well bid with gains of 3.8% and 6.8% respectively over the course of the week. ICICI Securities, the investment and broking arm of ICICI Bank reported a 91% year-on-year increase in net profit to Rs1.59 billion for the first quarter while revenues increased 35% to Rs5.15 billion. Full year revenues (2017-18) were up 32% to Rs18.59 billion. The bank reported respectable growth across its business sectors including broking, mutual fund distribution and investment banking. Broking revenues was up 32% year-on-year to Rs10 billion. This had its market share in the equity broking segment expand by 1.2% to 9%. The company added 460,000 new clients to the ICICIDirect.com platform, taking the total number of operational accounts to 4 million. The Board of the newly listed company suggested a final dividend of Rs3.9 per share taking the yearly dividend to Rs9.4. The stellar results from the company will help recoup some of the losses – the stock is down 19% after their IPO in March. ICICI Bank holds 76% of ICICI Securities. 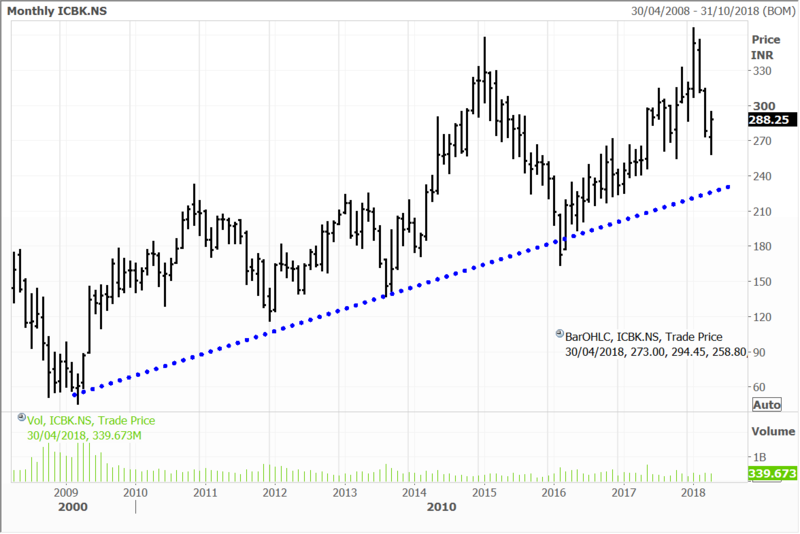 ICICI Bank is held in the Global Contrarian Fund and the Global Opportunities managed account portfolio. China has laid out the national guidelines for testing self-driving cars as the global race with the United States to develop autonomous vehicles continues. The rules require that vehicles must first be tested in non-public areas and that road tests can only be on designated streets with a qualified person in the driver’s position ready to take over control. China is making a push into the autonomous vehicles with the hope of their own national champions in self-driving compete with global leaders Waymo – the self-driving division of Google and Tesla. Chinese cities Beijing and Shanghai have previously announced their local guidelines for self-driving tests. Technology giant Baidu Inc has approval to test self-driving vehicles on the streets. China’s vice industry minister Xin Guobin said they will fall behind US rivals if they don’t “firmly seize initiative” in the sector. “We will accelerate to build a strong manufacturing country, a strong country in science and technology with strong networks and transportation,” he said. The fatal crashes last month involving the two US firms have placed scrutiny on self-driving cars globally and increased pressure on the industry to prove that the software and sensors are safe. Mr Xin said that China should work to advance other technologies needed to support smart vehicles like next-generation 5G communications networks and smart roads. 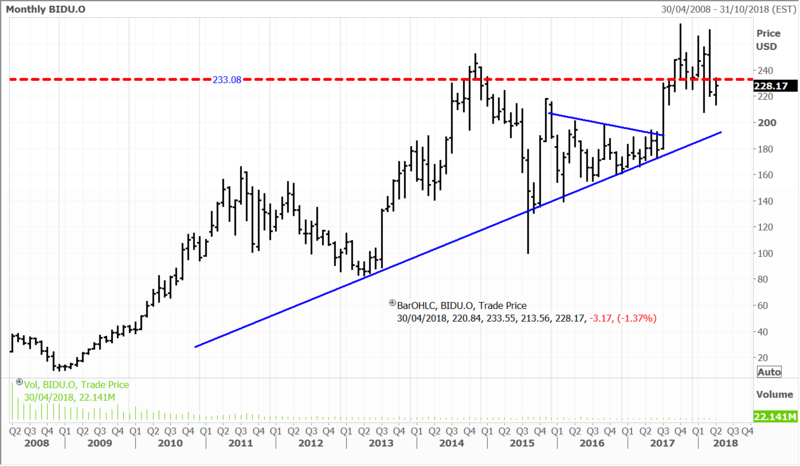 Disclosure: The Fat Prophets Global Contrarian Fund declares a holding in: Coeur, Volkswagen, Heidelberg Cement, BHP, Mizuho, Mitsubishi UFJ, Sumitomo, Fanuc, Sony, Inpex, MGM China, Sands China, Wynn Macau, CNOOC, ICICI Bank and Baidu.